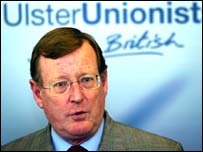 As the UUP leader David Trimble suffers a humiliating defeat by the DUP there are suggestions that he may resign within 48 hours. If you are looking for the 2007 election results for the Northern Ireland Assembly use the link below. The SDLP leader Mark Durkan wins the Foyle seat despite a strong challenge from Sinn Fein's Mitchel McLaughlin. Sinn Fein's Conor Murphy wins the Newry and Armagh seat previously held by SDLP veteran Seamus Mallon.